Peter Maxwell Davies, who died in March this year, was best known for his orchestral works. Yet there was hardly a musical genre that he did not explore. Yet Maxwell Davies piano music deserves to be better known and appreciated. This two-CD set with Richard Casey on Prima Facie should go a long way towards promoting such recognition of an otherwise neglected area of the composer's output. The most substantial work here is the seven movement Piano Sonata [CD.1 tr.s 1-7]. It was written for the pianist on these CDs, Richard Casey, who was born in Manchester (Max was part of the Manchester School) in 1966; and first performed by Stephen Pruslin at the Bath Festival in 1981. In some ways it's redolent of the three sonatas for piano by Pierre Boulez (who died in January): angular, penetrating, uncompromising; yet never at any point imposing stridency, or thrusting, where restraint is needed… the third and fourth movements larghetto, cantabile con moto [CD.1 tr.s 3,4] are good examples of such understatement. The fact that Maxwell Davies seriously considered a career as a concert pianist and played regularly throughout his life for pleasure (as well as deputizing, for example, for fellow Mancunian, John Ogdon early in their careers) is evident from the feel which the composer has for the instrument: elegant melodies, simple harmonies, the controlled yet unmistakable plangency born of the notes alone are evident throughout the dozen or so pieces on these two CDs. The Three Sanday Places [CD.1 tr.s 8-10] exemplify this confluence of pure sound and color which is surely at the core of true pianism well. Equally prominent in all these pieces is the extent to which Maxwell Davies – as in most of his work, in fact – is very much his own person. Never averse to a simple melody or intriguing rhythm – such as those to the fore in the Six Secret Songs [CD.1 tr.s 16-21] and Yesnaby Ground [CD.1 tr.23] – he is also at home with the apparently fragmentary as it pervades the Five Little Pieces for Piano [CD.1 tr.s 11-15] where the skein of ideas is stretched so wide that you can almost see the space between the notes. Casey, though, can hold all this together at every turn. Because of his total sympathy with the music of Maxwell Davies, he has the latter's vision to hand as he develops each movement and meticulously lays out each phrase and moment in the overall structure. His control of tempi is compellingly intelligent… listen to the "Blue Music" section of Parade [CD.2 tr.14], for instance. Nothing is superfluously ornamented or distorted for its own sake. At the same time, Maxwell Davies' voice is heard, with its delicate blend of a slightly elusive point which seems to lie between wistfulness and regret (as in the famous Farewell to Stromness [CD.1 tr.22]) on the one hand; and a determination that an individual composer in our times can (and must) simply communicate regardless of whatever else is going on around them on the other. Casey gladly assumes the role less of an interpreter of Maxwell Davies' ideas and wishes; more a bearer of the good news conjured up from a variety of sources by the composer's imagination. The works on these two CDs date from between 1949 and 2000; so practically the entire career of Maxwell Davies. Considerable variety should be expected. And it is indeed here for the taking. The Sonata and Five Pieces for Piano, Opus 2 [CD.2 tr.s 1-5] are atonal, yet rhapsodic in character. The pieces reflecting the composer's life in Scotland such as Snow Cloud, Over Lochan [CD.2 tr.7] and Stevie's Ferry [CD.2 tr.s 10-12] can be considered more "conventional". The sequence across the two CDs, though, highlights the diversity of writing for which Max is otherwise famed. What may strike the listener who is unfamiliar with this repertoire is that – with the exception of the "Green Music" from Parade [CD.2 tr.13], written when the composer was but 15 years old – no single movement lasts more than seven minutes. Indeed, many are under two. There is also a good degree of virtuosity required in these works. Some in order to elicit meaning from the simple (such as An Orkney Tune [CD.2 tr.6]); others (like the Five Pieces) because the music's sense and essence must come from a kind of concentration on our part which responds to directness and bravura. Casey has this sensitivity and technique in plenty; and is a delight to listen to. There is an intriguing recorded interview between composer and pianist [CD.2 tr.17] to round out what is a thoroughly satisfying and stimulating two hours music. Only the Piano Sonata is currently in the catalog, although other versions of Farewell to Stromness are widely recorded, of course. The acoustic of the Peel Hall at Salford University (the recordings were all made in August 2010) is spacious yet not too reverberant. It exposes the essence of the pianistic writing splendidly. 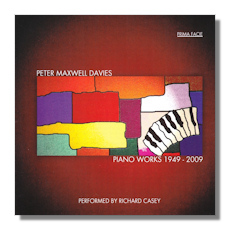 The booklet written by Pruslin consists of a brief introduction to Peter Maxwell Davies and the piano and a description of each piece. If you're new to the late Maxwell Davies, it would be an interesting exercise to try and discern how far this music is typical of him; or at least what the better known orchestral pieces, and the operas, say, have in common with it. If he's a favourite, it's probably unlikely that you have recordings of much of his piano music. In either case, the compelling and – above all, sensitive and respectful – approach and execution of Richard Casey, which is never reticent or obsequious, but privileges unadorned revelation over expansiveness, make this a CD not to be missed.